This is the bookshelf in my office. When we moved in, this was a blank wall. The room had no shelves of any kind. Hell, no closet either. So we had this built across one entire wall, with deep cabinets underneath to hold my board games and zombie heads. As is proper. 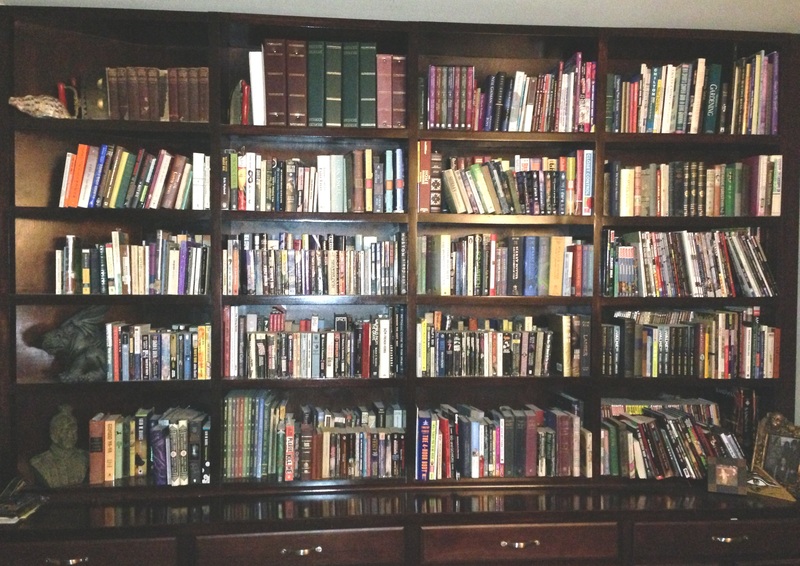 It’s hard to see from this picture, but each shelf is double stacked, with a row of books behind the ones you can see. There are more books, naturally, stacked all over the place: next to the bed, in the bathroom, on the kitchen counter, but this is where the ones I want to keep track of generally are. It’s where people who visit eventually end up, eyes roving up and down and side to side, looking for something good to borrow. To me, that’s the best part of having a bookshelf. I get to pluck stuff off the shelf and talk enthusiastically about the plot or a particular character or whatever. I get to practically re-live the book while talking about it. Usually it’s a book I haven’t seen in some time, and if the person doesn’t borrow it, I’m likely to pick it up myself. Now for the dilemma. While I love books, I don’t really think of the physical object itself as a book. I’m only interested in the word parts. So, for the last year or so, I’ve been buying ebooks if they’re available. Sometimes they lag behind the release of something I’m dying to read, so I go ahead and get the paper one, but if I can read something in seconds instead of hours or days, then that’s what I’m going to do. Which means that my bookshelf isn’t growing like it used to. There was a time when we had to fill up a trunk full of books to donate or sell at Half Price Books every couple of months, but that’s becoming a lot less common these days. I can see a time when my bookshelf just stops growing. It’ll still have my favorites on it, no doubt about that, but more and more the things I recommend to people will be books that I only have electronically. Either because that’s what I’m enthused about at the moment, or because they’ve already read all the stuff I have on the shelf that they’re interested in. And that’ll be sad. I find that while I love to own books, I like sharing them just as much. It’s a fundamental part of reading culture, this sharing of the books we love, almost like trading bits of our lives with each other. It’s how I became a reader, and eventually a writer, same as nearly everyone else I know. So, even as ebooks become more commonplace, don’t forget to share. If you have a Kindle, you can still lend your books to a friend. Same thing if you own a Nook. And check with your local library, you’ll be surprised at how many lend ebooks as well. Speaking as both a reader and a guy who sells books for rent money, I encourage you to lend your books. I want to see a hell of a lot less of this and more of this. Much more. If that’s true, wouldn’t it be amazing if you could choose those five people? Wouldn’t you be amazing? And what if they didn’t even have to be real? In that spirit, I’ve been tagged by Paige Addams to participate in the Circle of Five challenge. 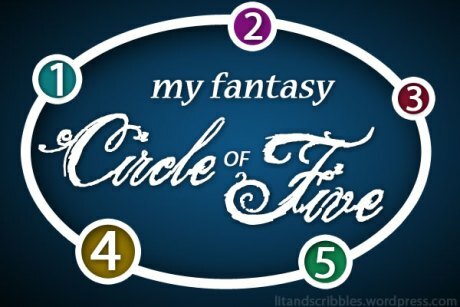 The rules are that you must list five fantasy (I’m going to assume fictional, rather than the genre) characters that you’d like to spend time with, and that you must pass the challenge on when you’re done. The protagonist from the novel Shibumi by Trevanian. Nicholaï embodies the idea of affecting the world through mastery of oneself. He survives in a world of violence by seeking tranquility, without confusing peace with being passive. He is able to spend years on a garden whose full expression will not come in his lifetime and at the same time is a master of the ephemeral arts of romance. If the Most Interesting Man in the World was a retired spy who could kill you with a plastic comb while contemplating ancient Japanese poetry, he would be Nicholaï. The protagonist from the novel The Man Who Never Missed by Steve Perry. Over the course of our lives, in small ways and large, we each face choices between our principles and the way we live. And more often than not, we choose comfort or convenience when we know we should do better. When we should be better. Emile does not. When someone tells you that one person can’t change the world, remember that Emile would ask you why that should make any difference. The act itself is enough. One of the Endless and the sister of Dream from the comic series The Sandman by Neil Gaiman. If you’ve read the comics, you already know why Death is listed here. If you haven’t, imagine for a moment that the embodiment of Death is a woman filled with joy, wit, and compassion, and that by spending time with her you can come to realize that every life is important enough to warrant the attention of the universe itself. An intelligent automaton from Penny Arcade’s Automata. More here. And here. Though hated, Carl does not hate. He works to protect a society that largely would see him destroyed and he does it without thanks or reward. Why? Because Carl can see the worth of the individual despite the actions of the group and he can separate right and wrong from retaliation and self-interest. Also, I can’t imagine not wanting to hang out with a robot private detective. If you can, then we’re veeeery different people. Annie bears the message that the secret to the universe is gratitude, from the movie happythankyoumoreplease. More than that, she also knows that accepting the love of others is the same as accepting yourself, and that you can’t truly do one without the other. Of everyone on this list, Annie is the one that I think the world needs most. This year I’m only going to eat broccoli and sunshine. While exercising. I swear to give up booze/smokes/panda livers/Bon Jovi for the rest of my life, starting at midnight. I will not kill another clown, so help me god. And what happens? As soon as March rolls around, you find yourself singing along to Livin’ on a Prayer while burying another sack of rubber noses in the backyard. I know, I’ve been there. As a self-help tool, resolutions are crap. First of all, they’re always some big dramatic change which is impossible to stick with over the long term. Big changes happen over time, small success by small success. Unrealistic goals are a sure-fire way to get discouraged. Secondly, they’re tied to a time of year. When was the last time somebody asked you how you were doing on your new year’s resolutions in August? And lastly, the whole tradition has failure built right into it. It’s easy to make a crazy resolution on the first day of the year, because nobody expects you to live up to it. It’s a given that you’ll do it for a few weeks and then move on with a laugh and a wave with everyone else. No more resolutions. No big declarations. Just one measurable step towards success every day. Let’s do it together. I’m going to put my money where my mouth is, so while you’re doing what you need to do, I’m going to let that clown out of my garage right now. This is a repost from way back in 2008. I’ve never reposted an older entry before, but I feel the need today. Ugh. You’ve just read a political article on Fox News/Huffington Post/That Damn John Scalzi‘s Site and the sheer wrongheadedness and deliberate ignorance of those stupid neocons/libs/greenies/freepers is just too much to take. You should, nay, MUST set them straight in the comments. It’s the only way they’ll learn. But are you really ready to play with the big boys? Do you have the tools you’ll need for the job? Do you even know what an ad hominem attack is? Read on, and get ready to join the trolling big leagues! You’re a busy person, just like me. Why waste time reading and understanding your opponent’s arguments when you can just cut to the chase and go for the guy making it? After all, surely his arguments are just as stupid as he is. So what if other, smarter, people are saying the same thing. Let’s not lose sight of the fact that the important thing is to win big in a comment thread on the internet. PERIOD. Somebody crowing about McCain/Obama’s economic policies? For heaven’s sake, don’t figure out what they’re saying, call them a name already! Don’t let that guy tell you what he thinks! What are you, a baby? YOU tell HIM what he thinks! That’s the way to do it. It’s not like you have the answer to every little argument anybody might make. To save time, just listen to your favorite pundit’s talking points, and then no matter what anybody says, you just reply with those. It saves a hell of a lot of time, let me tell you. The best part? You can’t be wrong if you answer your own questions. I think it’s pretty obvious that your position is not only the right one, it’s the ONLY one. Now, most comment thread ‘debaters’ aren’t going to realize that right away, so you’re going to have to make it plain and simple. Also, don’t wimp out when you use this beauty, combine with the Slippery Slope for maximum impact. For example, if gay marriage is allowed, the next day everyone is going to marry a pigeon. That pretty much shows the obvious consequence of gay marriage. Do you want to marry a pigeon? I sure don’t. Post hoc ergo propter hoc is just fancy talk for I WIN, JERK. You put one of those double vortex air spinners on your car, and your gas mileage went up. That’s proof right there, buddy. Did you put it on right before taking that long highway trip? Who cares? Driving is driving. Thing one happened, then thing two happened. You don’t have to be a school board member to see the science here. This one is pure gold when you want to show how stupid the other guy’s political candidate is. Just google his term of office, then google DISASTER DEATH FIRE PUPPIES. So easy a commie could do it. CAPS LOCK ON MEANS YOU’RE IN THE ZONE. CHECK YOUR KEYBOARD LIGHT TO MAKE SURE YOU ARE LOCKED AND LOADED FOR INTELLECTUAL DISCOURSE. I’ve done all I can. You’re ready. Now get out there and get mad! Post punk, post modern, post zombie. Zombies used to be damn scary. Night of the Living Dead, for all of its black and white, hard to see, grainy murkiness was terrifying. Dawn of the Dead in full, glorious color? Pants wetting. The idea of the walking dead was bad enough, but the execution and the technicolor gobs of flesh and squirting blood just pushed it over the top. It was the Best. Thing. Ever. And of course, there can never be enough of a good thing. Zombie movies started to crowd the limits of the B-movie sandbox. 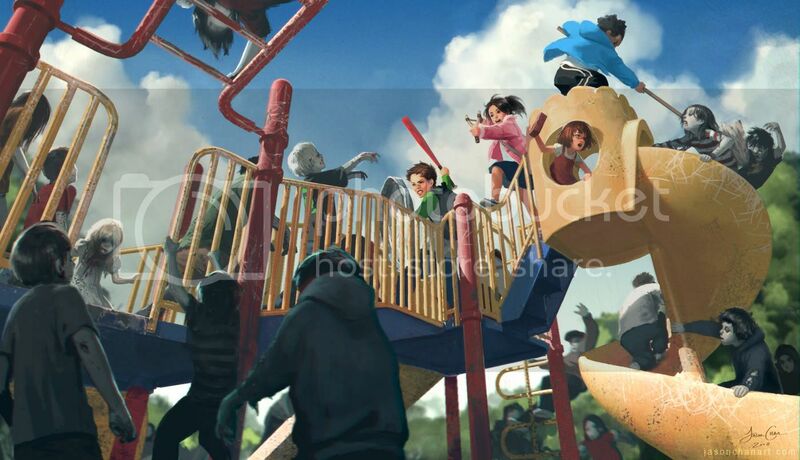 Then they started spilling over into the triple-A neighborhood with remakes, conceptual tweaks (infected, not zombies! And FAST! 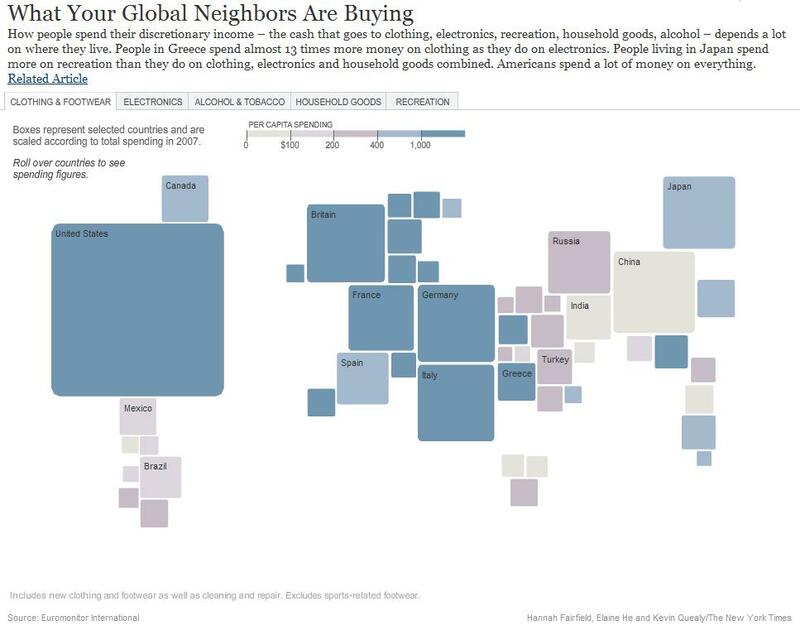 ), and then finally, when the market was as bursting at the seams, the inevitable happened. When the inevitable zombie apocalypse comes, we’ll look at it not with horror or panic, but with nostalgia. This isn’t a political blog, but damn it, sometimes things get so unreal out there that I feel the need to point it out, just in case it’s me that’s crazy instead of the world. Today I have two unrelated news items that separately give me the willies. Together they’re downright surreal. Item One: Unreasonable search and seizure laws permit checkpoints on the border that would be illegal anywhere else in the US. That sounds okay, until you realize that the border definition here has a width of 100 miles, which happens to cover two-thirds of the entire US population. Item Two: Yesterday the Supreme Court said that evidence obtained through illegal searches is okey-dokie to be used in your trial. Hell, why not just chuck the whole 4th Amendment? There’s really nothing left of it now but the box it came in anyway. I wish this story of a man who was detained in the US until he died painfully from cancer while separated from his family, was unique. I wish it was a tale from some villainous dictatorship overseas, or the actions of a regrettably insane person with no connection to any public authority. But it’s not. As an American, I don’t know how to express my anger and my shame at these events. I don’t know how to prepare for the next one to be revealed, which I know is underway even as I type this. But I do know that public pressure can influence the people responsible where decency and respect for basic human rights will not. Tell your next president, whether Obama or McCain.